In my last post, I talked about the stress caused by interviews and how to it reduced by breathing. Not just any breathing, but diaphragmatic breathing or belly breathing. There is a remarkable relationship between how you breathe and the stress you feel. Put breathing from your diaphragm into your preparations to ace interviews. If these symptoms look familiar, they are. These also happen to be the same things you feel when you interview. However, these signs can be reduced significantly by breathing from your belly or diaphragm. You used to breathe deep down in your abdomen. Everyone did. As newborns, you breathed from the belly naturally. You may even breathe like that during your sleep. Somehow, you began breathing from your chest. Perhaps it was because you were told to stand up straight with your chest out and stomach in. This posture constricted your abdominal muscles then reduced the depth of your breathing. Tight clothing does the same thing as does slouching when you sit. But you can relearn to breathe from your diaphragm. In few minutes a day, you can learn and practice breathing to increase your physical and mental wellbeing. It may feel strange at first, but with continued practice, you can change your breathing at will. You will be able to stop stress in its tracks whenever there is a need. To begin, first find a place where you won’t be interrupted. You can either sit down with your feet on the ground or lay down on the floor. Place one hand on your chest and the other hand on your stomach. Close your eyes as you breathe slowly through your nose. Inhale the air all the way past your lungs and down into your abdomen. You should feel the hand on your stomach rise, while the hand on your chest stays where it is. Concentrate where you want the air to go. Keep breathing this way for a few minutes. Increase the amount of time each day. Don’t rush and take slow even breaths. Practice while waiting for a traffic light. Practice as you are falling asleep. Practice while reading. Practice while watching a movie or TV. Practice while preparing for an interview. Practice anywhere and anytime you want. Just practice. You want to practice so that when you have an interview or a root canal, you will be ready to become relaxed and ready for anything. If you reduce your stress, you increase your interview performance. And your chances for a job offer. Arleen Bradley is a certified career coach and certified job loss recovery coach. She assists clients in moving beyond job loss grief in order to land dream jobs using the Job Loss Recovery Program. The Job Loss Recovery Program uses guided imagery to achieve results. To learn more about the Job Loss Recovery Program and how you can benefit from it, log on to www.arleenbradley.com. 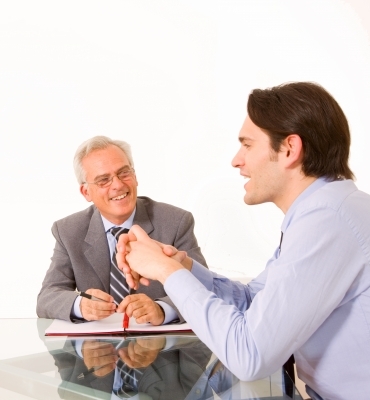 4 Comments to "Reduce Interview Stress and Ace the Interview"
Hope this helps you. Best to you. Arleen, good advice since interviewing is stressful and breathing right does help you to feel relaxed which leads to more confidence in the interview process. I know since when feeling tense I try to concentrate on my breathing to relax and decrease my stress. When your nervous you are not always at your best when interviewing and can become over whelmed which can affect your interviewing ability. Just remember to do this, it does work in reducing stress. Thank you Carol for your helpful information. With all the things you have to remember about interviews it’s nice to know there is a simple way to reduce the stress. « Interviews are like root canals without Novocaine.